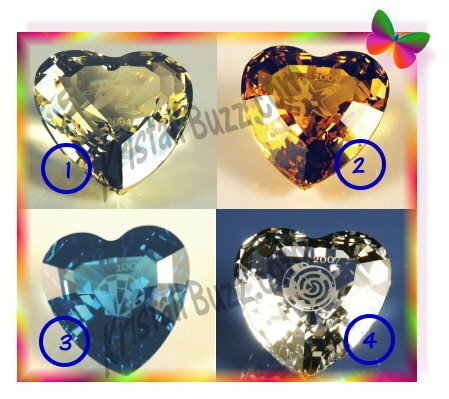 Yesterday I wrote about all the new 2012 Swarovski Crystal Hearts as well as the Swarovski SCS Heart figurines produced in the 1990’s. Swarovski still has many other heart designs if none of these seemed quite right for your special someone. From 2004 – 2008, the crystal brand produced Limited Edition Swarovski Heart Ornaments. These limited edition ornaments were annual editions and were laser etched with the production year and were hung by a ribbon. Swarovski Yellow Heart, celebrating Anna, the Swarovski SCS figurine in 2004. It is decorated with Anna’s ballet shoes and the year 2004. Swarovski Topaz Heart, celebrating Harmony, the Swarovski SCS figurine in 2005. It is decorated with a starfish and the year 2005. Swarovski Blue Heart, celebrating Eternity, the Swarovski SCS figurine in 2006. It is decorated with a shell and the year 2006. Swarovski Clear Heart, celebrating Community, the Swarovski SCS figurine in 2007. It is decorated with a spiral shell and the year 2007. These promotional hearts are all about 1.5” in height and retailed in the $45 – $50 price range at the time they were offered. They have flat surface areas featuring the small etching related to its corresponding annual edition theme. These Swarovski event hearts are a bit more difficult to find, but are still generally reasonably priced at less than $100 each. One of these Swarovski crystal heart figurines may be just what you were looking for to give your special someone during your Valentine’s Day dinner!